If you’re looking for condos for sale in Summit county, this one may be the one for you. 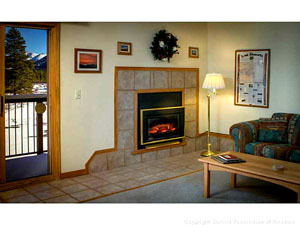 A luxurious life on the mountains can be yours with this lovely condominium in Keystone. In addition to gorgeous views of the Snake River and the Continental Divide, this condo has both a comfortable layout and lots of great amenities. It has 2 large bedrooms and it’s sizeable deck will allow you to entertain outdoors when it’s warm out, and the gas fireplace is the perfect gathering spot for winter nights after a day on the slopes at nearby Keystone Mountain. Also, the building offers a community hot tub and sauna so you can take a relaxing soak at your convenience. In short, whether you’re looking to move to Keystone or you’re interested in a seasonal vacation home, this clean, well-cared for condo is ready to move into today! Make sure to check out this beautiful home now before it’s gone. Keystone is a popular ski town for people all over the world. With its reasonably priced homes and spectacular mountain views, it’s no wonder so many people are looking for homes for sale in Keystone, CO.
What brings the skiers here are the mountains easily accessible to Keystone, so there is terrain for every kind of ski enthusiast. It is also the only Summit County resort that provides night skiing. This means people can ski up to 12 hours a day all season long. More daring skiers and riders can even use the massive terrain park and enjoy snow cat tours. Skiing isn’t the only activity in and around Keystone. The town has championship golf courses, a wide range of shops and restaurants and a number of other sports activities such as snowshoeing and snowmobiling. There is never a shortage of things to do and to see in the Keystone community. That’s why it’s one of the most beloved towns in Summit County. If you’d like to know more about Keystone, or the condos and homes for sale in Summit County, start by browsing listings through the site. You can search Summit County MLS codes or browse homes for sale by town. Once you’re ready to start touring homes or condos in Summit County, get in touch and I’m happy to schedule showings and find the perfect home for you and your family. Get in touch via email ([email protected]) or call my office line. I would love to be of assistance and help you find a home in Summit County that’s right for you.